Esplora Porto con una guida privata esperta con questo tour di un giorno da Lisbona. Conosciuto per il suo delizioso vino, il centro di Porto è anche un sito patrimonio dell'umanità dell'Unesco, con un'architettura incantevole. Visita il vibrante quartiere centrale di Baixa, cammina attraverso la verdeggiante vegetazione del parco Serralves, dove troverai anche il Museo di arte contemporanea, e assaggia alcuni vini e cibi locali eccellenti (a proprio carico). Situata sul fiume Douro, la città offre un mix di antico e moderno, che la guida ti spiegherà durante il tour. This was a 10 Star excursion! We had met our tour guide Tiago the day before when we did the half day tour of Lisbon. We were thrilled to learn that he would be our guide for our Porto trip as well. Porto is an absolutely beautiful city and Tiago made it come alive for us in the way only a very skilled guide can do. We learned so much about the history of the region, the culture, the food, and the present day life of its citizens. We ate a delicious lunch in a beautiful restaurant where we sat on the terrace overlooking the Douro River - absolutely perfect setting! After lunch we had our Port tasting which was very enjoyable! This is a great tour and Tiago was a wonderful guide and driver who made the miles fly as we learned about his life and family and he learned about ours back in New York City. Thank you so much Tiago for a very memorable experience! The trip was excellent. Our guide Tiago was very knowledgeable and helpful. Porto is beautiful and we will likely come back! We paid for a private tour and it was rather pricey, but what we received was a driver not a tour guide. The only site he talked about the entire day was the winery that we would be going to. Took us to the tower in Porto, dropped us off and gave us one hour to see the tower, the bookstore and a church. He did not provide any information at all other than telling us where the tower was and where the bookstore and church were and requested that we be back in an hour. No history of any of it or interesting stories or even where to buy the tickets as you even needed a ticket to go into the bookstore (5 euros per person). It took the entire hour to buy our tickets for the tower and climb up and get back down due to the crowds. This gave us the impression that he really did not know the town. We ended up having a nice day, but in retrospect, we should just taken the train. We would have saved a lot of money. What a great tour. Our tour guide Diego was simply amazing! He showed us all the hot tourist spots and the fact that we went at the end of October was a plus as they were not long lines anywhere. You must visit Library Lello, the oldest library in Europe. Another must is Taylor's Port winery. The restaurants along river D'Ouro are wonderful and the Bacalao a las brasas so tasty! A must do! Excellent in every way! The trip was amazing. Car was clean and well serviced, well maintained. Driver excellent. Safe and informative. Showed us all the sites. Arranged a boat ride to admire architecture and bridges. Wonderful food, fabulous restaurant. Driver explained points of Portuguese culture that would have been helpful to know earlier. This was our second tour with Aviator Fatima was the first...see separate review. Just like the first, the driver/guide Tiago was knowledgeable and kind. Throughout our trip, he became our Portuguese teacher, patiently correcting our grammar and pronunciation. We left the restaurant booking to him and his selection was spot on. We sat on the terrace overlooking a breathtaking view of Porto from the Gaia side Across the river Douro. The food and drink were simply out of this world! 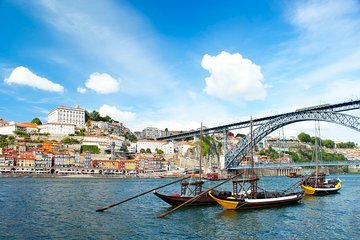 The visit to a winery and wine-tasting that followed, was the highlight of the visit.We would highly recommend this tour to anyone who wants to have a quick overview of Porto Need to stay a couple of nights in Porto if you need to visit all the spectacular sites there!. Family of 6 travel from Lisbon to Porto for full day tour . The driver that suppose to be a tour guide was only a driver. Didn't provided any information or had knowledge about a history at all His English wasn't the best either . Basically he was dropping us off from place to place and said that he will be waiting by the car.We would not recommend this trip .Viator- very poor job.